MTPConnect – the Medical Technologies and Pharmaceuticals Industry Growth Centre – today announced it will provide a proposed $100,000 provisional funding to a National MedTech, Pharmaceutical and Digital Health Showcase over one year, with proposed matched funding of $100,000 coming from the sector. The funding will allow the project to catalogue and track the progress of health innovations under development in Australia and make the information accessible to all on a public online platform. 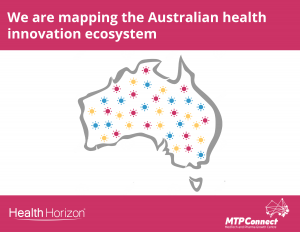 The project consortium is led by Canberra-based start-up Health Horizon, and includes national organisations like Medical Technology Association of Australia (MTAA), Health Informatics Society of Australia (HISA) and Medical Software Industry Association (MSIA). Industry members of the consortium include ANDHealth (Australia’s only national mid-stage digital health integrator and accelerator), hospital and health services intellectual property management company Hospital and Health Services IP Ltd and Novartis Pharmaceuticals Australia. The academic consortium members include the Melbourne Academic Centre for Health and influential health innovation groups from QUT and the University of Newcastle. The project will identify, catalogue and track in real time health innovations under development in Australia. Open to investors, health practitioners and the public, it will be a place for anyone to make sense of, and support, the diverse and rapidly evolving health innovation ecosystem. This showcase is designed to open up new avenues for private and public stakeholders to connect with and support innovations nation-wide, while improving the coordination, collaboration and transparency of the entire sector. This year, MTPConnect has selected 20 national MTP projects to receive $7.385 million in funding over two years with proposed matched funding of $15.2million coming from the sector. Last year, the launch of the program saw 14 projects receive $7.4 million in funding over two years, with matched funding of c.$15.6 million. Following the success of these projects, this year’s program received significant interest from the sector, with 33 applications from industry, research organisations and universities to share in the funding available, with a proposed $25.8 million of matched funding coming from the sector. MTPConnect was formed as an industry-led independent not-for-profit organisation in November 2015 as part of the federal government’s Industry Growth Centres Initiative to accelerate the rate of growth of the MTP sector to achieve greater commercialisation and establish Australia as an Asia-Pacific hub for MTP companies. The MTPConnect Head Office is located at the New Horizons Building at Monash University, co-located with CSIRO and industry. There are also key hubs at the University of Sydney’s Institute of Biomedical Engineering and Technology and the Medical Device Research Institute at Flinders University at Tonsley in Adelaide.